Mardi Gras centerpieces can be as wild and outrageous as any Mardi Gras party. Centerpieces can include glittering beads, bright bold colors, and unique symbolism. There are many ways to create a themed centerpiece for a Mardi Gras party, from formal and elegant options to wild and outrageous decorations. A bouquet could be made of multiple Mardi Gras masks that may double as party favors, or a single, more elaborate painted or jeweled mask could be surrounded by colorful beads or feather boas to serve as the highlight of the table. There are also premade spray centerpieces that can be found at party supply stores. These consist of small colorful foil masks displayed on a foil spray. 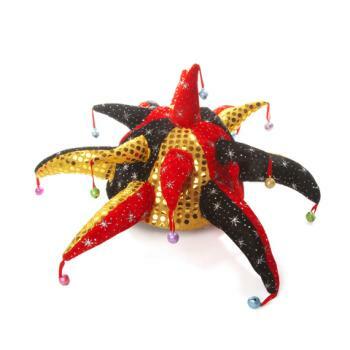 Fun and frivolity is essential for a Mardi Gras party, and a jester hat with its crazy colors and bells can symbolize the festive nature of the party. Add beads, garland, or other accents to turn even a simple jester hat into a clever centerpiece. The traditional Mardi Gras colors are purple, green, and gold. Make your own floral centerpiece following crafting instructions that use colorful flowers, feathers, and silk blooms. Be creative and add whatever you have on hand to make a one-of-a-kind creation. Because Fat Tuesday celebrates excess with rich, delicious foods and decadent desserts, an edible centerpiece is the perfect choice for a Mardi Gras party. Cookie bouquets, cupcake towers, or dishes of colored candies are all tasty options. You can also opt for a crazy colored, tilted tiered cake for a more elaborate edible treat. 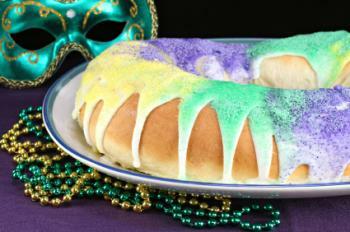 To keep with tradition, consider ordering an authentic King Cake to serve as your centerpiece and dessert. 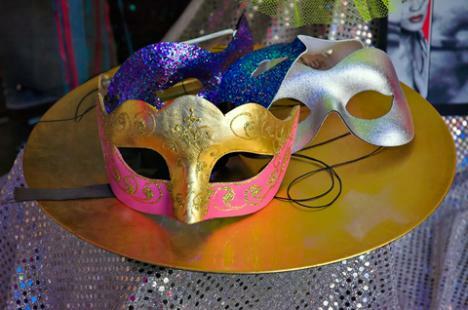 A Mardi Gras party can celebrate richness by spreading wealth through a treasure chest. Fill the chest with beads, gold coins, and gems in Mardi Gras colors. You can also make small bags filled with beads and candy that can be placed inside the chest to serve as party favors. 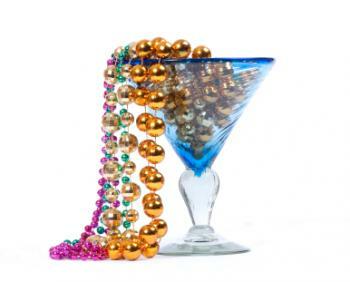 A more elaborate centerpiece option is to create a tower of iconic Mardi Gras beads. Use a curved wire support to stack graduated sizes of Styrofoam balls coated with glitter or paint in appropriate colors to create a tower, and surround it with smaller strings of beads or other colorful accents. Another bead centerpiece variation is to place colorful beads into a large clear glass vase or cocktail glass. This is a simple yet fun centerpiece that has many possibilities. You could also use a clear glass bowl if you do not have a vase. A colorful jeweled novelty crown can double as a king's centerpiece to celebrate the "king of fools" heritage of Mardi Gras. Fill the crown with beads, treats, or other baubles for an even more festive look. You can create an elegant centerpiece using feathers. A vase can hold colorful long feathers in shades of purple and green. You can either use a gold vase or fill a clear one with beads as an accent to the feathers. Use a variety of feathers for an interesting look. For a special touch, you can spray the feathers with glitter. Whatever centerpiece will grace the table at a Mardi Gras party, it should not stand alone. Well-coordinated table decorations enhance the beauty and impact of both simple and elaborate centerpieces and add more flair to the festivities. A richly colored tablecloth, garlands or beads strung along the table's edge, colored cutlery and serving dishes, and elaborately arranged trays of food will emphasize the party theme and provide a suitable backdrop for a beautiful Mardi Gras centerpiece. From simple, classic looks to elaborately themed creations, there are many Mardi Gras centerpiece ideas to choose from when planning a party for this wildly festive occasion. Some centerpieces may be purely decorative while others double as party favors or even additional snacks, but all of them will enhance the beauty and fun of a Fat Tuesday party and add the finishing touch to your table décor.